As mentioned in the previous newsletter, the distribution coefficient, an important parameter for the calculation of the retardation coefficient, will be discussed in the current newsletter. The distribution coefficient describes how a solute sorbs to the solid matrix in which it is located. A thorough description of the distribution coefficient, in addition to how it is determined, and what properties it tends to have, is given below, in addition to some example values, and a calculator. What is a distribution coefficient? How is a distribution coefficient calculated? Do distribution coefficients remain the same for all solutes? What are typical values of distribution coefficients? This is the most commonly used method of using a distribution coefficient in contaminant transport models. This is because it is linear and involves no variables other than the concentration of the species of interest it is computationally simple. This isotherm was originally derived to describe the adsorption of a gas monolayer on a solid surface, and above is the form derived from the original for aqueous systems. At low concentrations, the term KLmi(soln) becomes small compared to 1 that the isotherm reduces to a linear form. One of the most important properties of a distribution coefficient is that it should be measured experimentally for each system of interest, as it cannot be easily transferred from one system to another. Each distribution coefficient is representative of that particular solute, in that particular solid, at that temperature, and cannot be easily converted to properly describe a system with a difference in any of the properties. Distribution coefficients for reactive solutes tend to range from values near zero to 1 l/kg or greater. As these values are quite variable, it is difficult to give one general value to use as a default. The distribution coefficient is empirical (derived from experiment), and a parameter used for one field site cannot typically be used for another, even for materials from the same site. For organic micropollutants (typically hydrocarbons and chlorinated hydrocarbons), the distribution coefficient can be estimated by multiplying a known Koc value, which is calculated in the lab as the organic carbon-water distribution coefficient, by the fraction of organic carbon in the soil. The following is a table of Koc values for some hydrocarbons (From Appelo and Postma, 1996), and a calculator for determining the Kd value based upon the fraction of organic carbon in the soil (foc). The following is an example calculation for the distribution coefficient (from Appelo and Postma, 1996). As mentioned previously, the distribution coefficient is an important part of the retardation coefficient calculation. Retardation coefficients are often used to determine the location of a plume, based upon groundwater velocity. There are also field methods of determining the location of a plume, such as the use of the Solinst Interface meter. Appelo, C.A.J., and Postma, D. (1996). Geochemistry, Groundwater and Pollution. Published by A.A. Balkema, Brookfield, VT.
Drever, J.I. (2002). The Geochemistry of Natural Waters; Third Edition. Published by Prentice-Hall, Inc. Englewood Cliffs, NJ. Langmuir, D. (1997). Aqueous Environmental Geochemistry. Published by Prentice-Hall, Inc., Englewood Cliffs, NJ. Zhu, C. and Anderson, G. (2002). Environmental Applications of Geochemical Modeling. Published by Cambridge University Press, New York, NY. 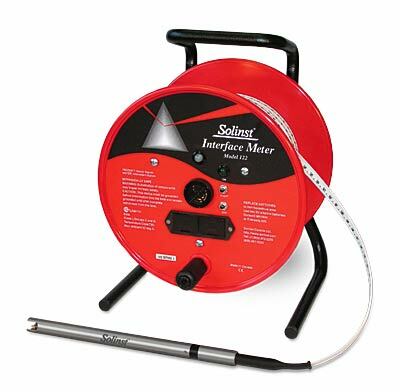 The Solinst Oil/Water Interface Meters give accurate measurements of product level and the thickness in wells and tanks. Determination of both floating non-aqueous liquids (LNAPL) and sinking non-aqueous liquids (DNAPL) is quick and easy. The Model 122 Interface Meter has been approved by the Canadian Standards Association (CSA) for use in explosive environments. How does the Solinst Interface Meter work? To detect liquids, Solinst Interface Meters use an infra-red beam and detector. When the probe enters a liquid the beam is refracted away from the detector which activates an audible tone and light. If the liquid is a non-conductive oil/product the signals are steady. If the liquid is water, the conductivity of the water completes a conductive circuit. This overrides the intra-red circuit and the tone and light are intermittent. Both sensors use exactly the same zero point giving accuracy as good as 1/100' or 1mm. The circuits are powered by 2 standard 9V batteries (one for the Mini) which are housed in easy access drawers on the faceplate of the reel. What are the Main Features of the Solinst Interface Meter?